Catherine has inherited her late father’s mathematical brilliance, but she is haunted by the fear that she might also share his debilitating mental illness. She has spent years caring for her now-deceased father, and upon his death, she feels left alone to pick up the pieces of her life without him. Caught between a new-found connection with Hal, one of her father’s former students, and the reappearance of her sister, Claire, Catherine finds both her world and her mind growing increasingly unstable. Then Hal discovers a groundbreaking proof among the 103 notebooks Catherine’s father left behind, and Catherine is forced to further question how much of her father’s genius or madness will she inherit. 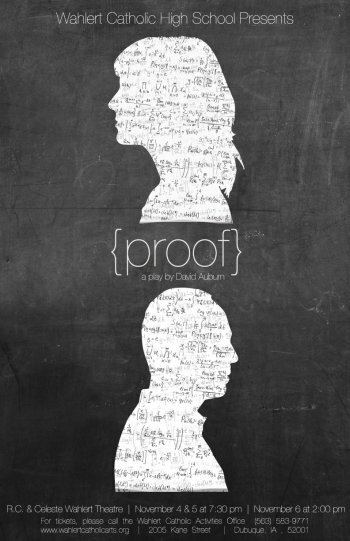 Winner of the Pulitzer Prize for Drama, David Auburn’s Proof is a passionate, intelligent story about fathers and daughters, the nature of genius, and the power of love.